(15/102) TRENTON – The Christie Administration has finalized the $3.2 million purchase of a 110-acre former golf course that will become a state preserve, the first unit of the State Park Service in Gloucester County, Department of Environmental Protection Commissioner Bob Martin announced today. The former Maple Ridge Golf Course, straddling Mantua and Deptford townships, will be turned over to the State Park Service to become a state preserve. Gloucester County will manage the preserve, which will protect an area bisected by Mantua Creek that is naturally transforming into ecologically valuable grasslands studded with clusters of woodlands. In addition, the Friends of Maple Ridge raised $125,000 in donations used toward the purchase and the Frank H. Stewart Trust, established to help preserve land in southern New Jersey, provided a $250,000 grant. Over the years, the golf course has been known as Tall Pines, Ron Jaworski’s Eagles Nest and finally Maple Ridge. Maple Ridge closed in 2006. Its greens and fairways have reverted to grasslands with clusters of natural shrubs and trees that are taking on the appearance of natural forests. The area has become a haven for songbirds, hawks and other wildlife. The property was purchased from GIBG, LLC of Westport, Conn. It will be assigned to the DEP’s Division of Parks and Forestry, Southern Region Office. Daily operation of the preserve will be handled by Gloucester County under a management agreement with the State Park Service. Officials with the Park Service are currently discussing possible names for the preserve. Mantua Township and the Friends of Maple Ridge will assist the county with the management of the Park. The preserve, and its network of existing golf paths and paved paths, will offer passive recreation opportunities, including jogging, bicycling, nature trails and fishing in two ponds. Christine Nolan, Executive Director of the South Jersey Land and Water Trust, credited the property owner for being patient as efforts to protect the area took shape over a number of years, which included coordinating complex grant applications as well as a door-to-door fund raising campaign by the Friends of Maple Ridge group. At one time, the property had local development approvals for 123 housing units. Helping to clear the way for negotiation toward the sale was a decision by officials in Deptford to reassign state affordable housing obligations to an already paved portion of the property on Woodbury-Glassboro Road. Support for preserving the property as a park started in January 2008. This support evolved into the founding of the Friends of Maple Ridge in May 2010, which mustered local support for preserving the land. “Anytime you can preserve land and allow it to return to its natural beauty it’s a win for the environment, our residents, and our quality of life,” said Mantua Mayor Pete Scirroto. 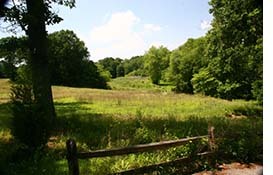 Together with public and private partners, the Green Acres program has directly protected more than 680,000 acres of open space and provided hundreds of recreational opportunities for a wide range of activities, including natural areas, hiking and fishing areas, city parks, playgrounds, athletic fields, boat ramps, docks, fishing piers and environmental education. In addition to providing recreation opportunities, Green Acres projects help protect water quality and stimulate economic development by creating jobs, at the same time making cities and towns more attractive places to live and work.